aSquared Candida Cleanse contains 15 ingredients that support the removal of candida from the body, cleanse and repair the intestinal tract, and support the immune system. Its unique herb complex of oregano leaf extract, caprylic acid, wormwood leaf, aloe vera, and anise seed aid in removal, while digestive enzymes, Cellulase and Protease, work to repair the gut. 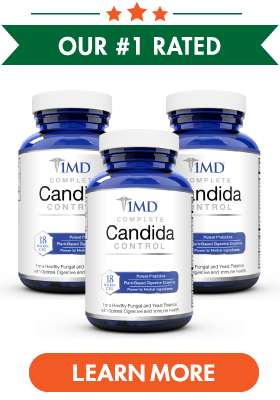 The aSquared Candida Cleanse formula also includes a unique blend of antifungals that works to naturally rid the intestinal system of any remaining bacteria, as well as probiotics, fiber, and Reishi mushrooms to boost the immune system. It is important to note that the labeling of this product is a bit misleading when it comes to the actual amount of the probiotic Lactobacillus acidophilus. The label states there are 4 billion CFU’s per gram, and each capsule is only 100 milligrams, meaning there are only 400 million CFU’s per serving of two capsules. aSquared Candida Cleanse has many positive reviews regarding the product’s effectiveness, but upon further review, we noticed that a large portion of the customers received the product for free from aSquared in exchange for a favorable review. We also noticed a pattern of reported side effects related to nausea and stomach upset, probably due to the fact that this formula contains a very high amount of oregano leaf extract. aSquared offers their customers a 100% money back guarantee on their Candida Cleanse, but it is important to note that you must request the refund in the first 30 days after purchasing the product. To be eligible for a return, your item must be unused and in the same condition that you received it, inside the original packaging, and the customer is responsible for the cost of return shipping. aSquared Candida Cleanse is an orally ingested product that treats yeast infections, as well as probiotic support for both women and men. While it does contain certain naturally-occurring products, we would like to see other important qualities like the use of organic and non-GMO ingredients. Another missing piece of information is the science behind their formula, and test results of its efficacy.